Today our walking plan is to complete a walk that we first attempted over twenty years ago when our children were young. On that day we terminated our walk when we reached a field of lively young bears and Lolly refused to go through the gate. We park in Stainforth and follow the road through the village until we reach the Craven Heifer pub, where we turn left and follow the lane round by the village green. Stainforth is an attractive Dales village, tucked away from the main road. 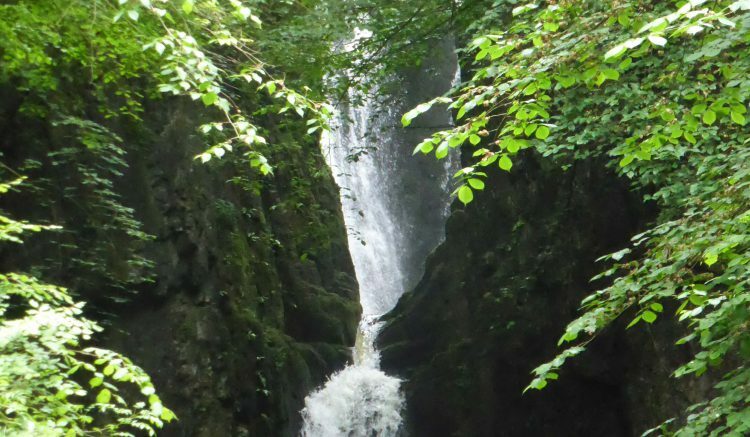 We walk up the walled track and on reaching the gate at the top we take a detour to our left to take a look at Catrigg Force. I cannot recall having been here previously, odd because we have holidayed in this area so often. The water flow is steady and the fall impressive, it must be a wonderful sight after a period of sustained rainfall. Pictures taken we walk back up to the gate at the top. There is a choice of paths, we take the one to the right. This is the point where all those years ago Lolly had decided enough was enough and she was not going into the field of bears. No sign of any today. We cross the field, keeping an eye out just in case they are hiding and planning an ambush. We go through the gate on the far side and take the path signed towards Winskill Farm. Before the farmyard we turn left down a track towards Lower Winskill and take a wall style. 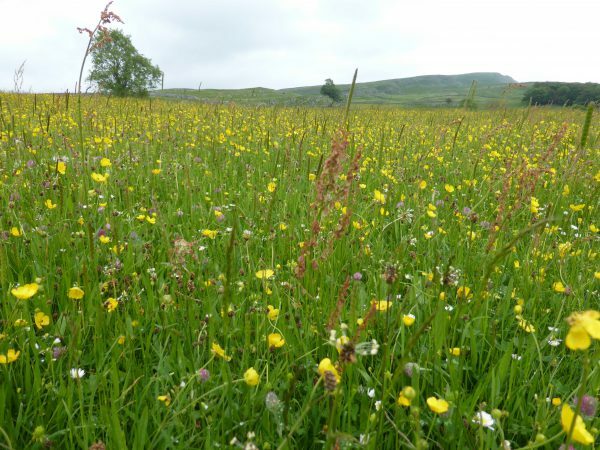 We have entered an attractive meadow of wildflowers, there are buttercups, red clover, vetch, daises and many others that I can’t identify. Across another couple of equally attractive meadows and then through a gate to descend steeply by the side of Langcliffe Quarry, this quarry was worked by the Craven Lime Company and was the reason that the, now derelict, Hoffman Kiln was built alongside of it. I have a cracking book about the Limestone Industries of the Yorkshire Dales written by David Johnson, it gives a real insight into the industrial and agricultural past of the Dales. Across another couple of fields and then along a walled track into Langcliffe. As usual the dogs are barking at the kennels. In the village we turn right down to the main road and then right again following the road, crossing the railway line and then taking the lane opposite to walk down to the River Ribble. By cottages we take the footbridge over the river and then follow the riverside path back to Knights Stainforth. Along the way we encounter bears on the path, they do not like Dexter and Crosby, they take some persuading that we should be allowed to pass. Eventually we do, but not good for the stress levels. 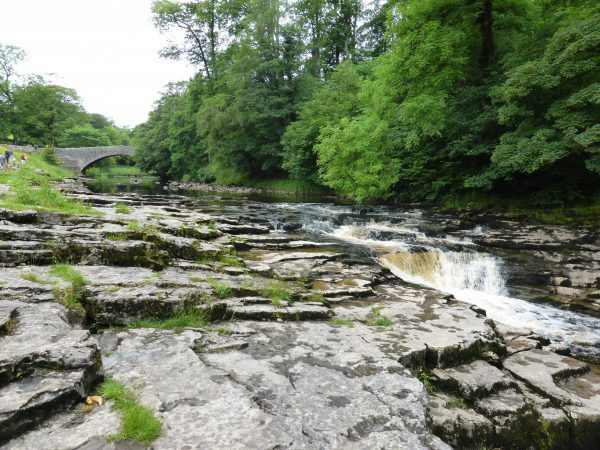 The final section of the riverside path takes us by Stainforth Force, with the water levels low this waterfall is not as impressive as Catrigg Force, but I have been here when the river has been much higher and it is then impressive. At such times it is also dangerous. A couple of weeks after I was here one year there was a tragic accident in Stainforth Beck the smaller tributary that flows here from Catrigg Force, two girls were swept away and lost their lives when their school party was river walking. Today the beck was a trickle of water that would have not caused anyone a problem. It goes to show that such places of beauty can also cause tragedy. We cross the old packhorse bridge and follow the lane to the main road where we turn right, and then left by Stainforth church to take us back to the car. An interesting stroll, close to six miles. Just right for a Sunday afternoon. In the evening we meet up with Maurice, Jane and Carl and go for an excellent meal at The Little House Restaurant, highly recommended. Good quality food and wine and excellent service.